Refurbishing Existing Asbestos Roofs – What Options? Over-Roof or over sheet the existing roof system. Strip off the existing roof system and re-sheet. Stripping off asbestos sheets is expensive and also renders the building non-operational in the areas which are being removed. Over-roofing or over-cladding can be the most economical method of refurbishing any building that has become unsightly or costly to repair and provides the opportunity to increase the insulation to improve U-Value and reduce carbon emissions. Please note the innovative steel support system is fixed back to the structure NOT the roof sheet. All fixings are in the pan of the sheet NOT the crown, thereby ensuring good fixity back to the structure. No requirement to strip off the existing roof. No costly transportation or disposal costs of existing roof. Continue to use the building WHILE the over-roofing system is installed. 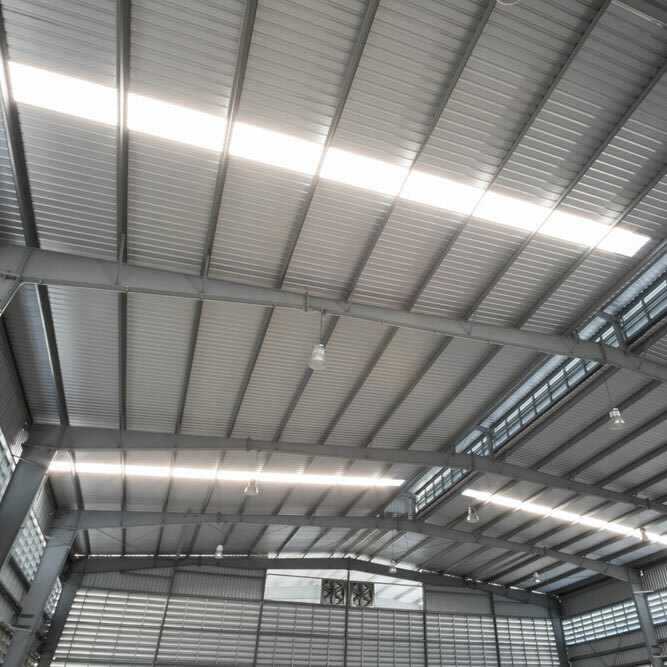 Convert the roof to an energy efficient roof system by adding mineral fibre insulation REDUCING your operational costs and decreasing associated carbon emissions. Upgrades and improves the aesthetics of the existing building. N.B. Whether to strip & re-sheet or whether to over-roof, all structures need to be independently assessed for any new imposed loads.